It looks like I'm not the only person wondering how space colonist will measure their time. LunarClock.org has developed a Moon time system. The Lunar year consists of twelve days, named after the first men who walked on the Moon. 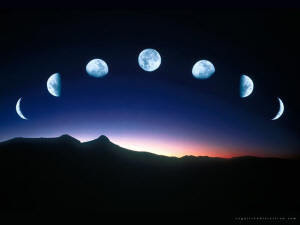 Each day is divided into 30 cycles of time, with each cycle being divided into 24 moon-hours. Each moon-hour then has 60 moon-minutes, which in turn of course are made up of 60 moon-seconds each. This feels similar to what we have here on Earth, does it not? That is the point. It feels similiar, but there are differences. Conditions on the Moon are somewhat different compared to the Earth. For one thing, you have about 15 days of continuous daylight (and then 15 days of total darkness). So, a "day" on the Moon, would correspond to about 29.5 Earth-days. About a month. And this is why we have months! You can see it in the sky, once every 29 days or so, you have a full moon, which is "noon" on the center of the disk. This is also called the synodic month. So, on the Moon, a day, counting from noon to noon, lasts about 29.27 to 29.83 Earth days. It is not a constant. The mean value, roughly 29.530589, is not a constant either! Over time it will be longer. However, this will not be a problem in the near future (your grandchildren might have to add a leap second or two though) . This means that we will have to fit 30 moon cycles into 29.53 or so Earth days, while keeping the same type of 24 hour clock that we have all come to know and love. The solution is to simply define the moon-second as 29.530589/30, and the rest follows. Go here for Lunar Standard Time definitions. Here's the time on the Moon! Italian Undersea Colony Experiment Underway!